Our little furry best friends won’t always be good boys, because why would they? It is their nature to be a little mischievous and naughty. However, there are times when they choose the wrong place, the bad time, and the worst thing to do. That’s when we may lose our mind and try to learn how to do some damage control. Unfortunately, shouting “No!” or “bad dog!” rarely works, which is why we asked our best dog trainers to share their best training secret, only to find out that it is way too easy than we have ever thought. So in case you have a new furry friend that drives you crazy sometimes, this list is for you to understand all the secrets and to learn how to train your doggy. Have you ever tried to train your dog in a public space, like a dog park or a crowded neighborhood? I know, it didn’t go as good as you thought it would. The reason is there were too many distractions, and dogs are not multi-taskers. So the first thing you need to pay attention to is to be in a boring, non-distracting environment. Technically, it should be an empty room with no toys, pillows or anything that may attract the dog’s attention. Don’t forget the high-value treats for rewards. Make sure to find the ones that he will go crazy for when performing a new behavior. While walking your dog with the leash, have you ever wondered if you are the one walking your dog, or if your dog is walking you? In any case, and from now on, you should forget about the yanking latter because when you try to pull back, the dog will pull forward. Not because he is being difficult or stubborn, it is just the way dogs were designed. Allow me to explain more: when the dog pulls and gets where he wants to go, he will feel rewarded and will always continue that behavior. The only solution is to walk your dog on the leash inside. So if he walked successfully next to you in your home, advance to the front yard, backyard, and then around the neighborhood. Eventually, your dog will master the art of walking next to you with or without a leash. Don’t forget to reward him. Again, try to practice it in a boring room with no distractions. This way you will avoid seeing your dog picking up gross things from the ground when you take him outside where more dangerous and harmful items exist. Even while being a good parent who holds poop bags every time you walk the dog, it is still embarrassing when he still chooses to poop in the middle of the street or on your neighbors’ front lawn while they are right there watching everything. Thankfully, there is a solution, a very simple one actually: guide your dog to one specific spot where you want him to poop, give it a few minutes, and don’t speak, smile or play with him. Let him sniff and soon enough, he will realize that it is time to make number 2. You have to reward him heavily and immediately with his favorite treats. It may sound easier if you just opened the door and let your cute puppy take care of their potty business on their own, but you will always end up with “poop land mines” everywhere. The solution is to train the dog using a leash in order to teach him how to get used to eliminating when you are close to him. Then you should reward him with his favorite treat and take him for a quick walk. If you rushed back inside, they may consider it as a punishment so he will quickly learn how to hold it in instead of letting it all out. So, make him poop/pee immediately after you let him go outside, then the quick walk should be the reward for doing it in your preferred location. Have you ever thought why would your puppy bark at vacuums and hair dryers? According to Donna Culbert, a dog trainer, and owner of Donna’s Do Right Dogs, barking does not only for showing excitement or anger, it is also for expressing their fear and anxiety. So when your dog barks loudly at that moving object that makes a scary “unusual” noise means that he is really scared, and he may even start chasing the item as he freaks out. So to calm him down, put the item (unplugged) on the floor with treats sprinkled all around it, let him discover it slowly, then change the location of that item away from your dog as you are giving him treats in order to keep his calm. Once you feel like he is starting to accept that object, turn it on. If he didn’t bark, then he must have controlled his fears and you should reward him. Finally, you will be able to use that noisy item without scaring your little puppy. Speaking of rewards, it is not right if you order the dog to “come!” then ask him to lie down. The reward must equal the joy that you made your dog leave to come to you. For instance, he likes to chase cars because he finds it a fun experience, but also, very dangerous. So instead of shouting “Come!” you should command it with a ball or a squeaky toy, and then have your dog chase you. You can make it a little more entertaining by letting him catch you and then immediately play tug with him for a minute. You made sure that your sweet puppy has dinner, potty time accomplished, played fetch, and all was good. But for some reason, he is looking at you whining and giving you a sad puppy look that breaks your heart. According to many dog experts, there are many reasons that drive dogs to whine including boredom, excitement, anxiousness or need for attention. The best solution to end their “attention whining” is by ignoring them completely. For some puppies, even saying “No” is rewarding because they have got your attention. If you ignored him and he actually stopped whining, reward him with a treat so he can understand that no whining equals attention. In order to have a calm, sweet dinner with your family, date or yourself, you should teach your puppy from the beginning to go to a specific spot during your mealtime to avoid any annoying barking or begging. 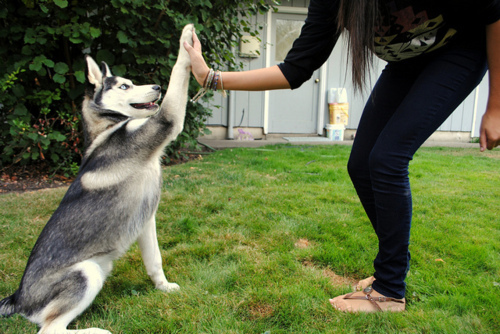 When the dog goes to his place, don’t ignore him completely, say hello and give him a treat. Or you could give him something tasty to chew like a bully stick or a marrow bone in order to distract him for a few minutes. If he came back to the table, try to lure him back politely. This one can be a little difficult, but with consistent training, you will definitely get the results. In case you need to know if your dog is ready to be home alone without a crate, then pay attention. If he gets into things while you are still around, then probably not! However, if he is not destroying anything anymore, then he might be ready. It is best to close the rooms where you put the most valuable things before leaving him. Like your office or the kitchen. Pick a small space and put all his toys around so he can be satisfied with all the things surrounding him. That way, he will be distracted for a while from destroying anything valuable. But first, you have to conduct a few tests before leaving him for a long time. Try 15 minutes at first, 40 minutes, and advance to an hour, etc.